Peppa Pig is a phenomenon. I don’t know what it is about the little pink creature that will stop V doing whatever she is doing in her tracks and stare, but I can report that the stage production has the same effect! She not only sat and watched the whole show intently but also, for the first time, sat on her own seat throughout. Peppa Pig’s Treasure Hunt is a simple story about, yes, you’ve guessed it, Peppa and her friends going on a treasure hunt! Danny Dog, Zoe Zebra and Pedro Pony join her and brother George as they all follow a map which takes them from the bushes to mountains, a wood, a pirate island and home again. The TV characters are escorted by “Daisy”, a friend of Peppa, played by real life actor Charlotte Sullivan, who drives the action and instructs the audience. On their journey they use a wide range of transport – car, train, pirate ship and hot air balloon – all piloted, of course, by Miss Rabbit who, with her neverending plethora of jobs, is the Peppa equivalent of Myleene Klass. As the story progresses, there are loads of catchy tunes with plenty of opportunities for the audience to join in with the words and actions and I was particularly pleased that they had worked in the Bing Bong song, my personal favourite. They also manage to shoe horn a UV light scene into the tale. Peppa idly searches in a rock pool for the treasure – as you do – which leads to a full on under the sea scene with colourful fluorescent ocean creatures floating around a black stage. It’s a real skill to faithfully translate a cartoon onto the stage and make it believable, but this production successfully does it using puppets. You might wonder if children, who are always very sharp about these kinds of things, would realise and / or care that they were puppets, especially as you could see who was operating them. However, it does work, and if you’ve ever seen the adult show Avenue Q, you will know why. That show makes you realise, even as adults, that while you know how the puppets are being operated, you just forget about it and enjoy the show because the story enthralls you and this Peppa show is exactly the same. The children MUST realise that they are puppets – but it doesn’t bother them. 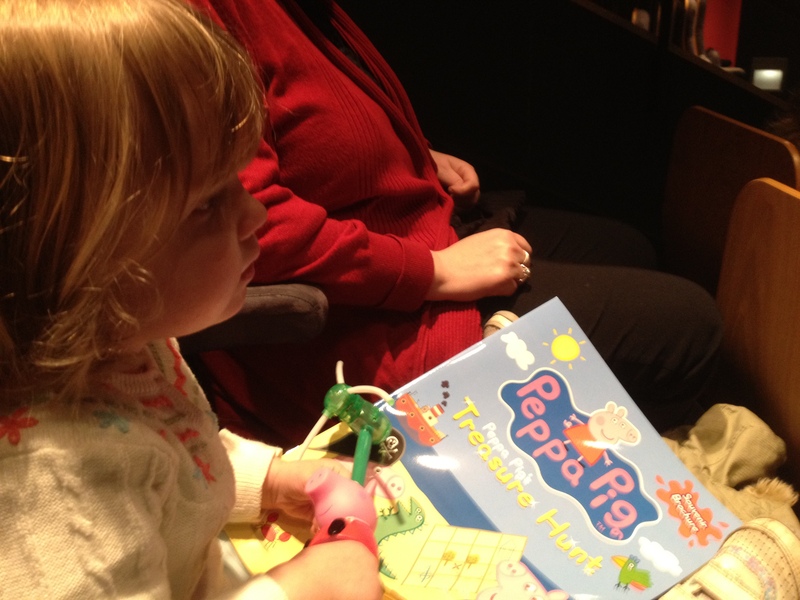 It helps that the voice of Peppa is very faithfully recreated by Hannah Lucas. “I enjoyed the show” she said. This is all I need to class the trip as a triumph! It doesn’t matter what I might have thought, as long as the person who the entertainment was aimed at, got a lot out of it! Luckily, I enjoyed it too! The show was the perfect length for us. A first half of around 35 minutes with a 15 minute interval and then another 25 minutes or so. Given that the TV episodes are usually no more than five minutes each, it is testimony to the power of the character that Peppa can hold a child’s attention for a much longer time as well. V has just turned two and she sat all the way through it and “got” the story enough to be asking questions about the plot. Basically if your child is at an age where they really enjoy Peppa they should enjoy this version. As always, younger siblings should also do OK – it’s a children’s show, it’s never a completely silent audience! Merchandise was, as always, pretty overpriced but if you want to get something, I would go for the souvenir brochure / activity book. It’s a fiver, which though expensive is not much dearer than a pre-school children’s comic these days and it is very good quality. The spinning windmill lights that are de rigour at a panto, that we paid a fiver for at In the Night Garden, were a wopping £7.00!! Sadly I felt the need to get one as we hadn’t brought her comforter “toppy” with us and we needed a back up distraction! I have stopped taking “toppy” with us on trips like this as she doesn’t need to sleep but I think I will take it again in the future – it really doesn’t do any harm, it’s not drink or drugs and it will save us a pile of cash! As it turned out, she didn’t need a distraction as the show held her full attention. T-shirts are £10, again they are good quality but still pricey for toddler sizes. However, I preferred to get one of these than a toy because you at least get a lot of use out of it.